Longmire is a guilty pleasure. It’s an enthralling crime drama set in small town and rural Wyoming. 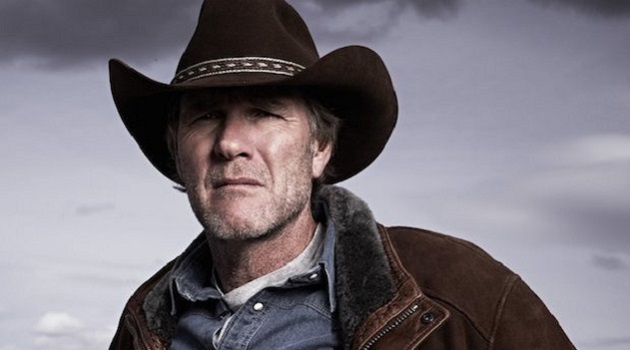 The protagonist is Sheriff Walt Longmire, and old-school lawman who doesn’t like cell phones and doesn’t do things “by the book.” It’s also one of the most ridiculous and completely unrealistic shows on television. Dozens of murderers, serial killers, organized crime members, kidnappers, major drug traffickers, wacko religious cults, and anti-government extremists all seem to reside in fictional Absaroka County, Wyoming. Walt’s methods, which include constantly making false accusations and threatening to murder or assault suspects if they don’t confess, wouldn’t exactly hold up well in court, either. In spite of all this, I can’t help but love the show. 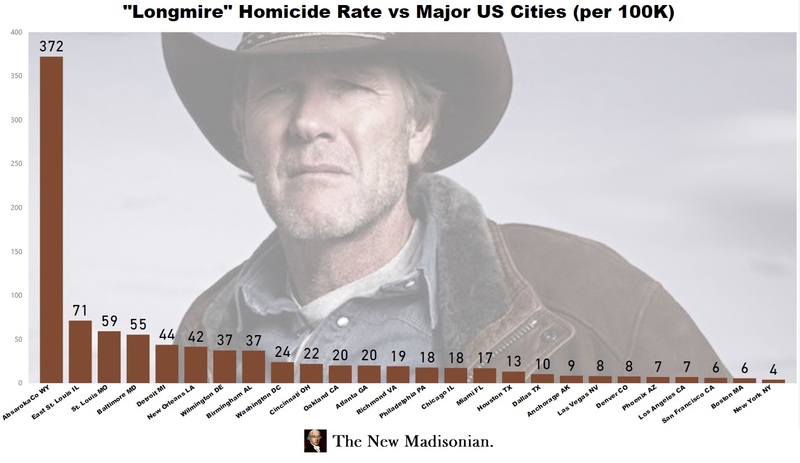 That’s why we have set out to answer a few key questions: what is the homicide rate in Longmire and how does it compare to the rest of the US? To answer that question, we have to do three things: (1) count the # of homicides, (2) deduce the time frame, and (3) deduce the population. The main town in Longmire is Durant, Wyoming. It appears to be based on Buffalo, Wyoming (population 4,600). Buffalo, WY is in Johnson County, which is extraordinarily rural with an estimated population of 8,500 and a land area that is over 3 times the size of Rhode Island. We’ll assume that Absaroka County shares similar characteristics to its real world counterpart. Number of homicides is the next issue. If we simply take the first two seasons, there were 27 homicides. 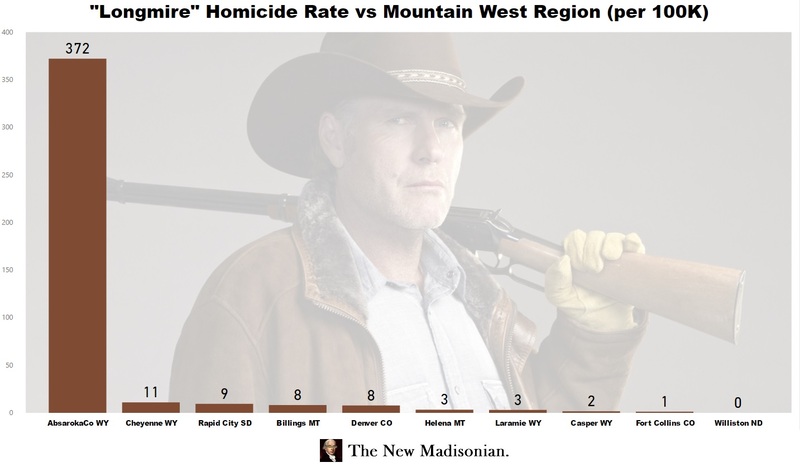 This was documented thoroughly by Grantland writer Ben Lindbergh in his piece, The Body Count: Is Absaroka County the Most Murder-Plagued Place on TV? I also decided to double-check and re-watch the episodes myself and came up with the same number. Now for the trickiest part: the timeframe. That’s less clear. In the absence of clues, we might simply decide that 1 season = 1 year. In this case, however, we have a major clue with the Sheriff’s election storyline, which starts in early Season 1 and doesn’t resolve till near the of Season 2. This suggests the 27 homicides that occur during the first two seasons happen in less than a single year. The estimated timeframe would have to be in the 7 – 10 month span. Therefore, we’re going to have to extrapolate the homicide rate a bit. We played things conservatively and multiplied the 27 homicides by 1.2x, giving us 32 homicides for 1 year. With all these assumptions under our belts, now we can visualize the homicide rate in Absaroka County, which clocks in at an astronomical 372 homicides per 100,000 people. First off, let’s compare Absaroka County to other places in the Mountain West region. The MW region has some of the lowest crime rates in the US, which means it’s not even a contest, as Absaroka County has a homicide rate of 30 times that of Cheyenne WY, which is the second highest data-point in our sample. OK, so Absaroka is pretty violent compared to the real Mountain West region, but what about major US cities? As it turns out, Absaroka County makes Detroit, Baltimore, and St. Louis seem pretty tame by comparison. Absaroka’s homicide rate is nearly 7 times that of Baltimore’s and over 8 times Detroit’s. 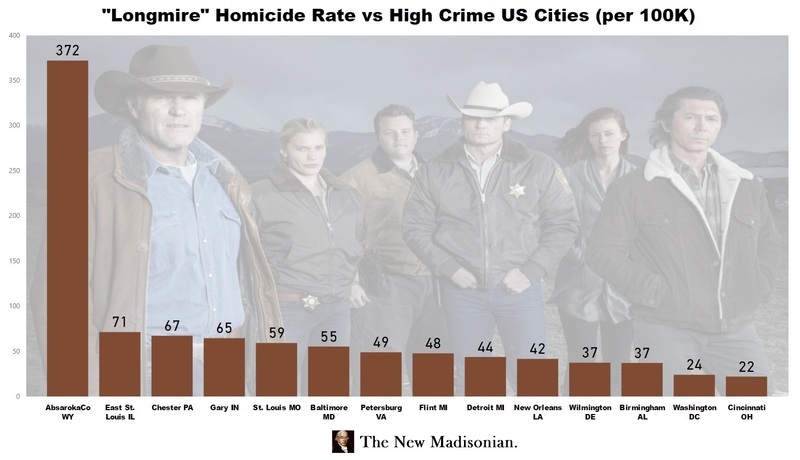 Finally, let’s compare Absaroka to some of the highest crime cities in the US. No surprises here. Absaroka’s homicide rate is over 5 times that of murder capitals: East St. Louis IL, Chester PA, and Gary IN. Frankly, there are war zones that are probably safer than living in Absaroka County WY! There’s only one place I’m aware of that might possibly be able to compete with Absaroka in terms of senseless violence. That place, is, of course, Cabot Cove ME, home of murder mystery writer Jessica Fletcher. 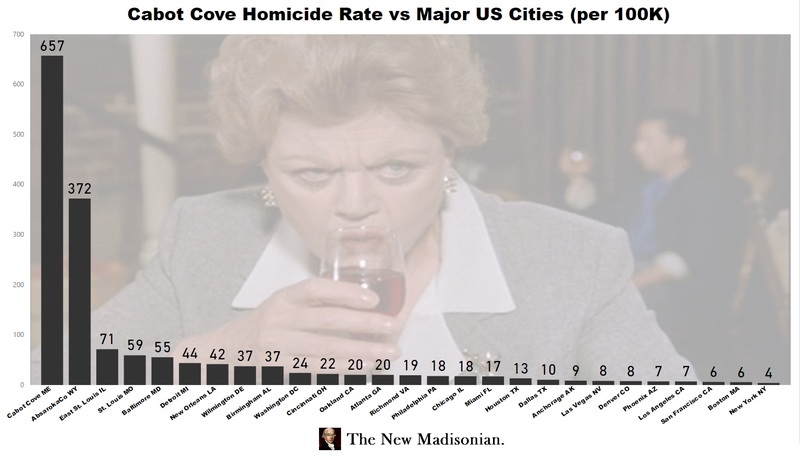 In order to calculate the homicide rate in Murder She Wrote‘s Cabot Cove, I used the number of murders from a 2012 Daily Mail article, “The most dangerous place on Earth …“. Since I’ve never really watched Murder She Wrote (other than it going on in the background of my grandmother’s house when I was a kid), I decided to divide the 274 murders by 12 years (for 12 seasons), giving us about 23 homicides annually in Cabot Cove. With an estimated population of 3,500, that means Cabot Cove’s homicide rate is a sky-high 657 per 100K citizens. So Cabot Cove actually manages to beat out even the extremely violent Absaroka County. This is why some have speculated that Jessica Fletcher is actually a serial killer. We can only speculate what would happen if Jessica Fletcher were ever to decide to leave Maine and retire in Absaroka County WY! For those who grew up in the 90’s and remember West Coast gangsta rap, you might be familiar with the infamous City of Compton. It’s the home of many notable rappers such as Dr. Dre, Easy-E, Ice Cube, Coolio, MC Ren, MC Eiht, and of course the team that started it all, N.W.A. 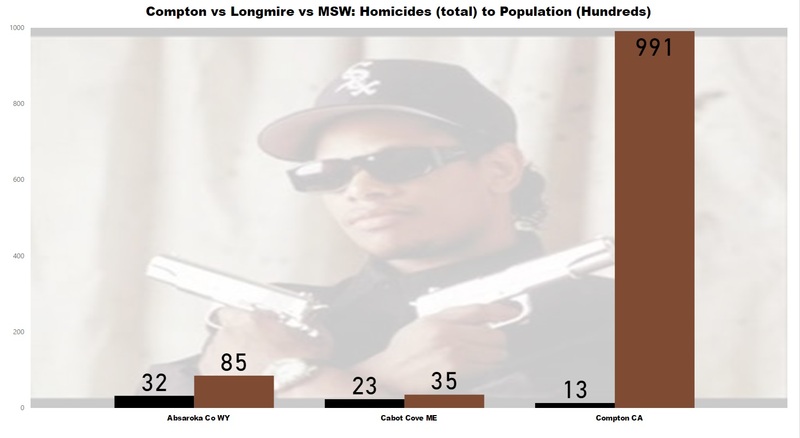 How does notorious gang-banging Compton CA compare to Cabot Cove ME and Absaroka County WY? Of course, you already know that we were going to conclude that Compton has a lower homicide rate than Absaroka and Cabot Cove. The more interesting part, however, is that Compton has a population about 12 times that of Absaroka County and nearly 30 times Cabot Cove. And it still has less homicides total. For our sample year, Compton had 13 homicides, compared to our estimates of 32 in Absaroka County and 23 in Cabot Cove, so even ignoring population adjustments, Compton has a lower number of homicides than both places. Give credit where it’s due, however: people in Compton have taken great efforts to clean up the city and get rid of its gangster image. Compton CA actually has a relatively moderate homicide rate compared to other major urban areas in the US. It’s closest to Houston TX out of major cities. Not quite “low crime”, but it performs better than Miami FL, Atlanta GA, and Philadelphia PA.